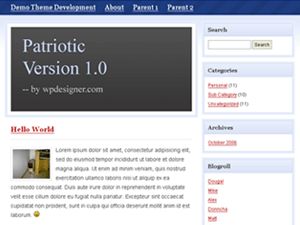 Description: A 2-column version of a previous theme named Patriotic. Like its predecessor, it’s widget ready. Despite tomorrow is the last day of my challenge, which would be a good reason to release a great theme to cap off this a-theme-a-day challenge, I’ll lay low, rest up, and get ready for what’s coming after the challenge is over. Sunday is Chinese New Year. To wish you a happy new year, I will… release a new year theme. What a surprise!